Clean ducts are essential for having quality air in your home. In order to improve air quality and ensure your home stays comfortable, regular inspections and air duct repair and maintenance are required. Professional duct cleaning will help eliminate high energy costs and allow you to feel good about the air in your home. If you’re not sure why you’re having air quality issues in your home, check out a few of the most common air duct issues. Problem: Air ducts are not providing sufficient air flow. Poor air flow could be caused by ductwork that is improperly routed, too long, or has too many bends. Homeowners may be able to identify the problem by inspecting and cleaning their ducts. Although, underground ducts and vents hidden in floors or walls may need to be examined by a technician. Problem: Air ducts are leaking. Major inefficiencies can be caused by losing air that circulates through the ducts. By having ducts properly sealed, you will lose less air and allow your system to work less at bringing air to the vents. Leaking air ducts can also cause pollutants to enter your home, reducing the air quality. Problem: There are poorly sealed registers in the system. 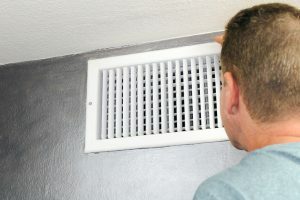 If registers are not sealed properly at the duct connection, you can lose air before it even reaches the vents due to loose seals or other factors. Furthermore, you could be wasting energy — according to the U.S. Department of Energy, between 25% and 40% of energy that is used to heat or cool a home is wasted partially due to the HVAC system forcing it to work harder if there are contaminants built up in the system. Problem: Duct system was designed improperly. Poorly designed duct systems cannot properly supply and return the required airflow to keep your home comfortable. Even if the equipment is correctly sized and functioning, the overall system may still be inefficient. By keeping an eye on the functionality of your system, you can save yourself the headache of wasting energy, money, and potentially being without heating or cooling. Keep an eye out for uneven temperatures, stuffy air, loud or strange noises coming from ducts or in the walls, excessive dust, strange smells, and especially spikes in cooling or heating bills. Air duct repair is not something that should be avoided, and if you don’t feel comfortable trying to do it yourself you can contact a professional.